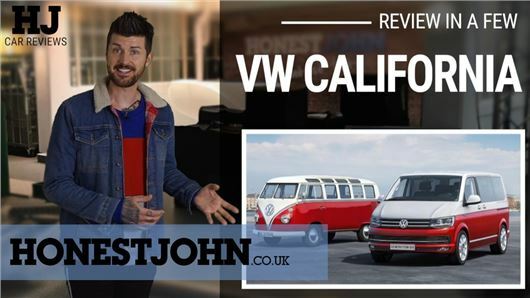 The T6 generation California is by every measure the best camper van ever made - but you'll pay for it. About £60,000-plus. Ouch. When this 'toy' grows up it might be a suitable replacement for my adult Hymer. Refreshingly watchable, could have started me saving though really want a Merc to be entirely honest, especially as the relative cost difference is mentioned.. love the style very much though guys. The rattle was from the slide-out table. Mine does it and has done since 2009 when it was built. I "put a sock in it" to dampen the rattle down! REALLY..! ..? £65K and you have to dampen a ‘rattle’ from a sliding table with a sock? I’d use the sock with a billiard ball in it , visit the VW dealership it came from (or wotever source) and suggest it gets sorted pronto - no way I’d put up with that .... £65K is a lot of ‘get it sorted NOW’ Either Ron is cashed up so much so, that it doesn’t bother him , or, he’s too nice to make a fuss. I’m neither, so would definitely be using the sock too.....just in a different manner, to rid the rattling din! Having read that though, if I had the spare change to buy one of these type motors, I’d opt for the Merc V class. Great video though guys!